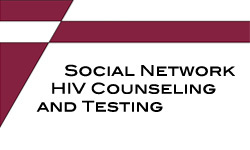 What We Do: The Social Network HIV Counseling and Testing Program aims to identify and test gay and bisexual men and transgender women in Los Angeles County who are at high risk of HIV acquisition and transmission and who are unaware of their HIV status. The program uses a social network model, or Respondent Driven Sampling, to identify and recruit participants for testing. Potential peer health advocates attend a group orientation, which explains the social network methodology and informs potential peer health advocates that they will be requested to recruit individuals from their social, sexual or drug-using networks whom they believe to be at high-risk of HIV infection. Testers (both those who test HIV negative and positive) are then linked to appropriate medical, social, psychological, CRCS and other needed services. The engagement of new peer health advocates is an active and ongoing part of the program. Those who wish to become recruiters are assessed for eligibility and appropriateness. Enrollment: Those seeking an HIV test must be identified and recruited by a peer health advocate. Friends Community Center is not a drop-in HIV testing facility. Hours: Weekdays, 10:00 a.m. – 4:00 p.m.
Funding Source: This program is funded by the Los Angeles County Department of Public Health and sponsored by Friends Research Institute, Inc.